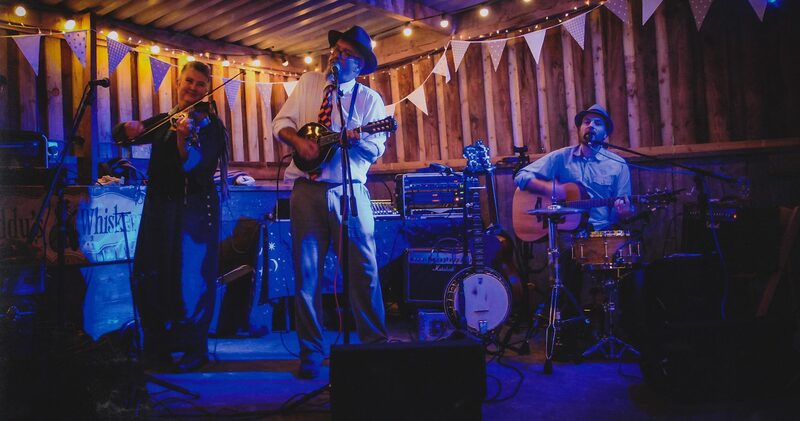 Paddy’s Whiskers are a full time, professional three piece band, based in Devon, who play an exciting high energy mix of Irish, Scottish and American folk music and song. They perform at festivals, gigs, ceilidhs, barn dances, weddings and parties in Devon, Somerset, Cornwall and across the South West. Andrew plays banjo, mandola, mandolin and guitar and sings. Jules plays fiddle and border bagpipes and also sings. Andrew and Jules spent over a dozen years travelling around Europe in a bus, busking and gigging for a living before settling in Devon to raise their young boy and to have more musical adventures. They also teach banjo, mandola, mandolin, guitar and fiddle…. Andrew is the band’s resident DJ for after show parties. Andrew and Jules play as the duo Re-Jig – ideal for smaller gigs, barn dances and ceilidhs. Marcus plays cajon (a Peruvian percussion instrument derived from a tea chest – often used in flamenco) and guitar. He is also a poet, artist and the talent behind Paddy’s Whiskers graphic design and layout for logos, backdrops, CDs etc. Our occasional fourth member (and bass player) is Simon who plays five string bass like nobody else…a brilliant and talented musician who has toured widely playing a variety of different styles, he also has a deep baritone voice for backing vocals and harmonies (and a wicked sense of humour!! ).